As a beautiful girl in her most fulfilling period, Myanmar melts us completely in its sweetness and charm. A Burma trip is like to dive into another world. In addition to exceptional landscapes, the music and traditional dances of Burma demonstrate the incredible cultural richness of the country. You just have to see the dancers of Myanmar once and you will feel the spirit of dances, the spirit of the performer. The Burmese classical dance appeared in the Innwa period (13th century). It consists of 125 basic steps of learning, arranged in the gabyalut choreography. In general, people dance in groups in which young men and women dance together. It demands that performers express themselves skillfully. The dancers of Myanmar are all very beautiful and ingenious. They wear royal clothes, including long-sleeved jackets and beautiful belts. Normally, the dance is very lively and requires artists to perform difficult movements, similar to circus acts. His melody is very dynamic and relatively difficult. The legendary love of the royal couples between Mintha and Minthami (prince and princess), the founding mythologies (Zawgyi - the magician), and paintings from the Burmese Ramayana are often told. Other roles include supporting characters, soldiers and Nats. There are also very interesting Anyein dances. These are simple dances combined with lupyet clowns, forming funny performances to narrate current sarcastic events and other topics. Two or more dancers simultaneously perform this dance with swords or small and large drums. In a trip to Burma, if you want to learn the traditional dances of Myanmar, start with the basic dance of ka-Bya-LUT. Then you can gradually learn more difficult movements. You will have to be really patient and enjoy learning. There is also a very interesting dance in which the dancers make movements like puppets. 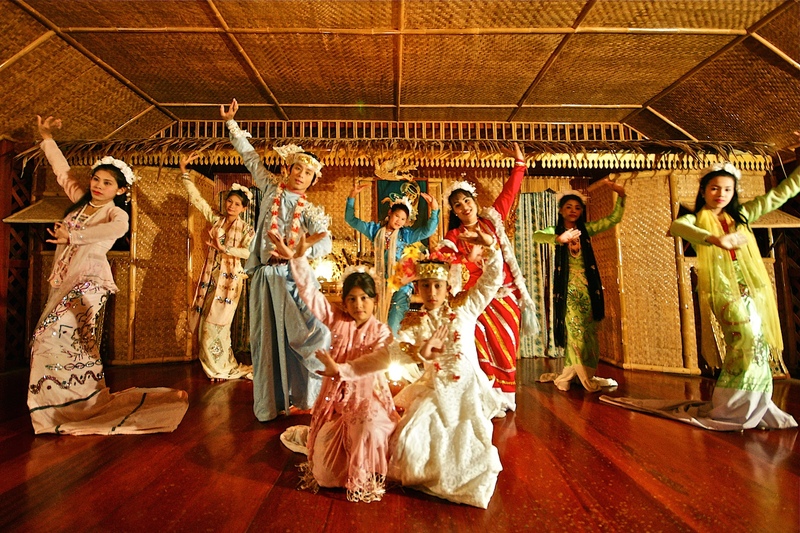 This is why it is said that the dance is a theatrical imitation of Burmese puppets, in which they replace real dancers. Travelers to Myanmar will be delighted with many wonderful dances. You will see, during the Water Festival, the beautiful dancers wear sumptuous clothes and perform dances to the sound of Yein music. At the Elephant Dance Festival which usually takes place in Kyauein near Mandalay, we also see a team of dancing elephants. Unknown to a number of travelers, Myanmar has retained its idyllic beauty. Many tailor-made travel agencies in Asia offer you tours and programs that you can not miss. They bring you not only unforgettable moments and new experiences but also an opportunity for you to immerse yourself in the culture of this mysterious country. Each country has its own cultural beauty. If you are on a Myanmar travel, do not miss the opportunity to discover and enjoy the folk dances of this country and see the dexterity of dancers, which makes you love Myanmar more.